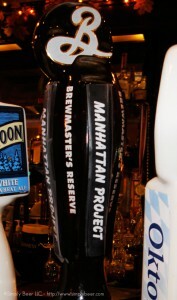 My latest find on the Brooklyn Brewmasters series is the Manhattan Project. Like, the Sorachi Ace, I found it on draft at the Cloverleaf tavern in Cardwell NJ (you can only get the Brewmasters series on Draft). I think of all the Brewmaster beers I’ve had this one has a very cool back story. Brewmaster Garrett Oliver certainly loves beer best, but many good things provide inspiration. In this case, it was the realm of traditional cocktails. So Garrett decided to conjure up something unique with his friend David Wondrich, America’s top cocktail expert and winner of the 2008 James Beard Foundation Book Award. A few years back, David introduced Garrett to the classical version of the Manhattan, made not with bourbon but with rye whiskey, red vermouth and bitters. It quickly became Garrett’s favorite cocktail, and it spawned an idea. 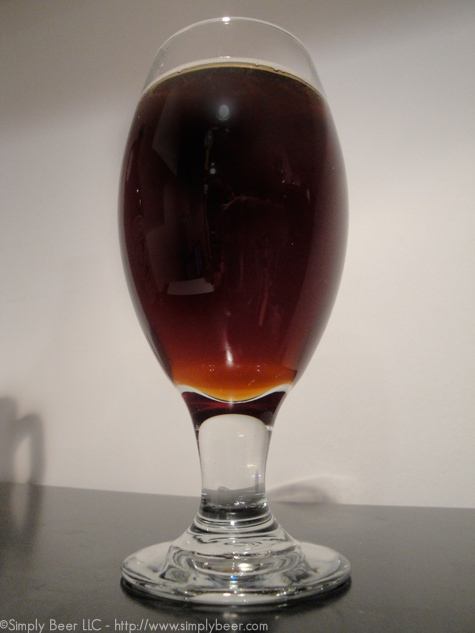 A robust rye beer, partially aged in Rittenhouse 100-proof Bonded Rye barrels from the Heaven Hill distillery, and then infused with the herbs and spices that flavor red vermouth and bitters. Then a dash of tart cherry, and the result is THE MANHATTAN PROJECT, a tasty new beer showing echoes of New York’s most famous cocktail, the Manhattan. It is great as an aperitif, but also with game dishes, especially duck. Poured from a 2 day old 1/2 filled(because we drank the other half) growler since it is only available on draft, Most of the carbonation was gone, but when I had pour it the 2 days earlier it had a nice dense head. The beer it self is a burgundy brown color with red hues and a bit hazy, which just means it was referemented in the keg and/or is unfiltered. Very neat aroma, tart cherries, bit of oak, and lots of spices like cardamon and cinnamon. It is very enticing with this being an experimental beer, it doesn’t really fit into any predefined categories, so well just roll with it! With the concept being a “Manhattan”, I can’t really compare since I don’t drink them. I can tell you this beer has a sweet cherry initial flavor, that fades to bit tart where it picks up cinnamon and ginger and finishes strongly with good burst of dry rye. This isn’t too sweet not is it too dry, but blends well together. A very interesting beer, strong rye profile, complex lots of different aromas and flavors. I enjoyed this beer, though it was unique and well crafted. I love rye so this sounds really interesting to me. But my chances of getting to try it will be slim to none. @gservo – you should head over to the Cloverleaf and try it, worth the short trek. @mike – Yeah, it’s only available on draft. find out who the local Brooklyn distributor is an maybe you can find it on draft in FL??? I really enjoyed the rye in this beer, the aging in rye barrels really added a bit of extra depth. I haven’t been to the cloverleaf in some time. I should head out there soon! I remember having a really good steak there and being impressed with the beer selection even though I didn’t really know anything about beer at the time!